I bet that you, like me, know someone who has had their identity compromised. Maybe it even happened to you, a hacked email, stolen credit card number, phising emails…there are so many ways to have our identity hijacked. We are who we are, until someone pollutes that for their own gain. These are thieves, enemies of the truth who use us for their purposes and our destruction. It can be hard to get your identity back in the cyber world but fortunately, when it’s our spiritual identity that’s been compromised, there is a clear path to the truth, found in God’s word. Identity Theft: Reclaiming the Truth of Who We are in Christ lays out that path for us. And right now, I have this to say-I’d appreciate it if you read the review but really, just go read the book right now. Really. Identity transformed: Reflect on what I looks like to live in our new (and true) identity. There isn’t a bad chapter in this book, each one take you a little further down the road in a walk with Jesus, beginning with the intro titled Who Am I? From there the chapters unfold the path from salvation to being made in God’s image, beloved, redeemed, filled with the Spirit and into the outworking of our identity in Christ through connections with the church, worship and service. Jen Wilkin’s opening chapter Free: Rescued by Grace sets the foundation for the whole book. Again, every chapter was so valuable, and I found chapter 5, Fruitful: Filled with the Holy Spirit by Jasmine Holmes particularly excellent for two reasons. First, she exposed through her own story (which, by the way, all the author stories are mercifully brief) that she always identified herself as one “type” when in fact she was really a different type all together. This is dangerous ground for all of us, a trap many of us fall into-we, from various sources determine who or how we are or want to be, and find ourselves in a futile cycle of trying to live within or up to that type. The second great point she makes is through a rock solid treatment of the Proverbs 31 woman. Concise and focused on the right understanding of Proverbs, this paragraph could be the key to freedom you didn’t know you needed. This is what God says about who you are if you are in Christ. The book is decidedly unapologetic about this in all the best ways, clearly laying out in a concise way what the Bible says and why it matters. What I found most helpful about this book in general is the tone of each chapter, a beautiful blend of grace and truth. It’s easy to hammer down on a topic with the truth of God’s word and neglect to apply grace needed for transformation, or liberally apply grace without the call to heed the truth that we are sinners who need transformation. Each author accomplishes both in their given chapters. 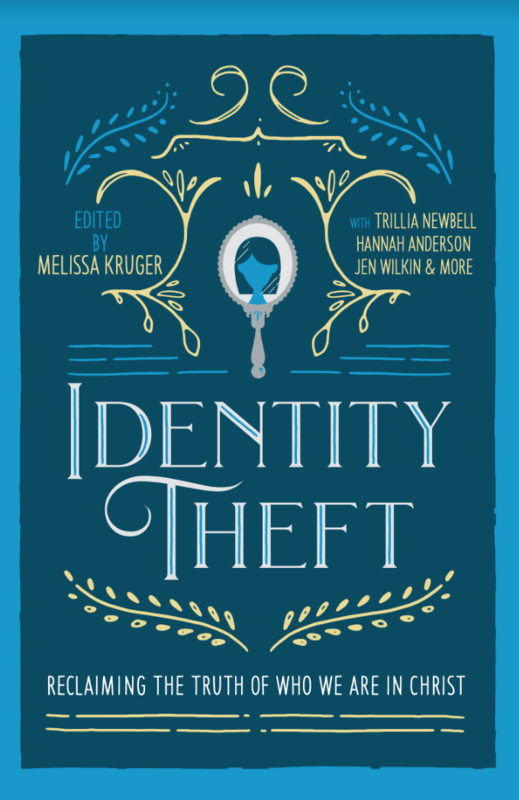 Identity Theft will no doubt be in my top 5 books of this year. Just read it. Really. Then give it to a friend. It’s time to reclaim our identity in Christ for His glory and all that He intends for not only us but that the world may know what a Jesus Follower looks like.